As audiovisual technology continues to improve, video conferencing plays an increasingly important role in running a business or organization. The ability for instantaneous face-to-face communication between people in different parts of the world allows companies to expand their scope while operating with greater flexibility. For more productive, less restrictive meeting time, design and setup your conference rooms with video conferencing in mind. Organizations can improve both their workflow and their budgets with video conferencing, which greatly reduces the need for business travel. Key players are able to collaborate on projects from across the country, while hiring managers can meet candidates “in person” without flying them over for an interview. Traditional phone calls may be enough for some meetings, but video conferencing allows for visual materials, like slides or graphic designs, to be shared easily. Video conferencing not only makes meetings more convenient but allows more of them to be held when necessary—all team members’ schedules are clearer without commuting or air travel on the calendar. The technology also makes it possible for more employees to work efficiently from their homes, where they may benefit from a better work-life balance both on and off the clock. Video conferencing might be most commonly associated with business, but its applications go far beyond corporate environments. The technology creates more opportunities for education, enabling guest lectures from esteemed professors in a certain field, participation in cross-cultural exchanges between international schools, and collaboration between faculty members of different institutions. Similarly, medical professionals use video conferencing to consult each other on cases and share their research. Audiovisual capabilities have reduced the need for rural hospitals to transfer patients to better-equipped facilities for a diagnosis. In the legal world, individuals have become able to deliver testimony without being physically present for a trial or deposition. Because video conferencing is such an integral part of how a modern-day organization functions, it’s important to setup video conferencing in the office in a way the technology can be used most effectively. When making your video conferencing equipment checklist, you must not overlook your conference room furniture. A conference table fit with outlets and grommets can power your audiovisual devices while keeping their cables organized, and AV carts are available to hold and move objects needed for a presentation, like projectors or laptops. If key personnel or guest speakers will be addressing larger groups, a lectern with a built-in sound system can make sure everyone in the room hears them clearly. 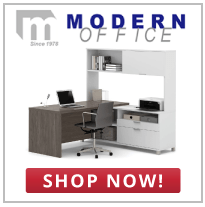 Modern Office specializes in all of the office furniture you’ll need to create the optimal video conferencing setup in your conference rooms. Our designs and aesthetics have changed to suit modern business needs, but our commitment to quality and competitive pricing has remained the same for more than 25 years. We’ll ship furniture of any size within the contiguous 48 states for free—browse our wide selection of conference room furniture now and order when you’re ready.